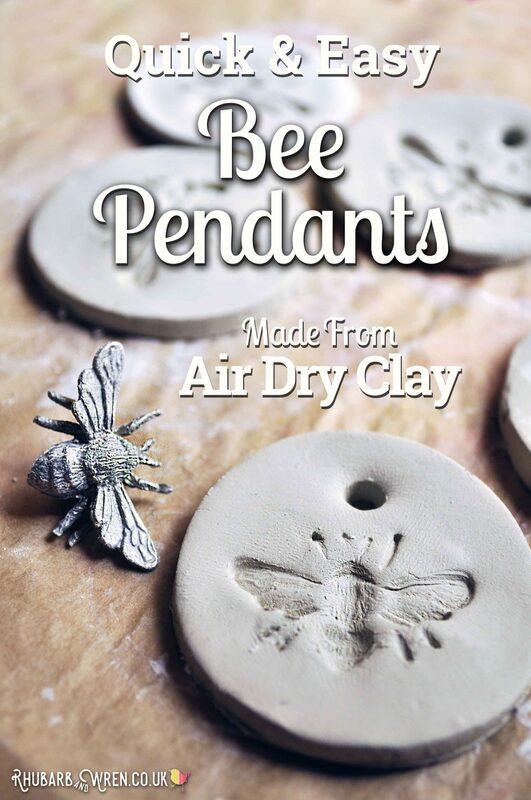 If you’ve not got much time or just want the bullet points on how to make these fabulous air dry clay pendants, click here for the Quick Read Instructions. Otherwise, read on to find out how to make these bee-utiful bees for yourself! 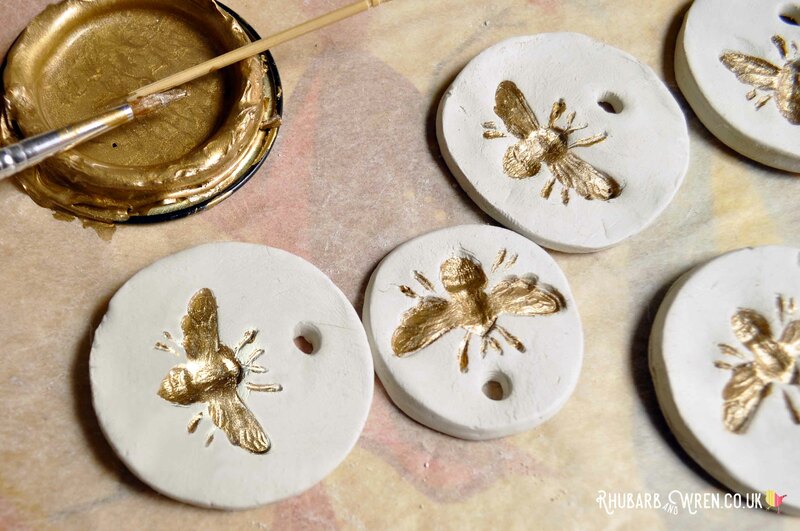 Our little bees were simply stamped into circles cut from air dry clay, and then painted gold to up the treasure appeal. They were very quick and easy to make, but if you haven’t tried using air dry clay before, I have a few tips and tricks you should try. 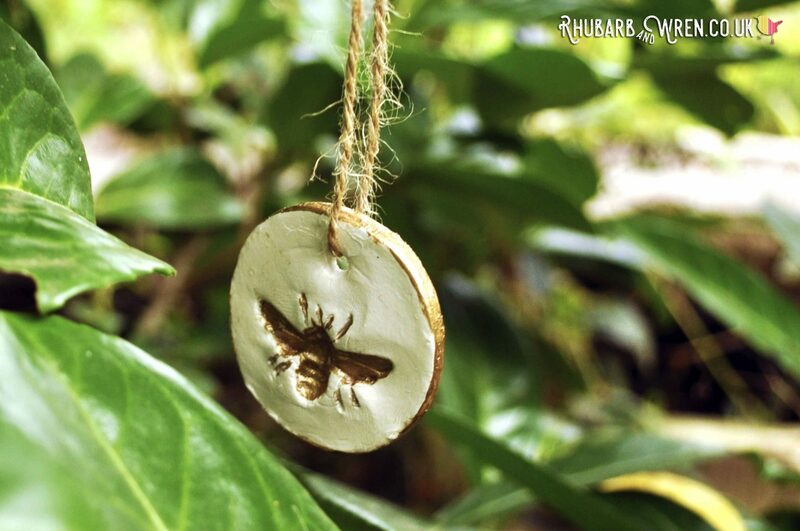 A little gold paint turns simple clay pendants into worthy treasure for a treasure hunt! Just as its name suggests, air dry clay hardens without needing to be fired in an oven, so it’s great for using with kids. It comes in a big brick, wrapped in plastic. 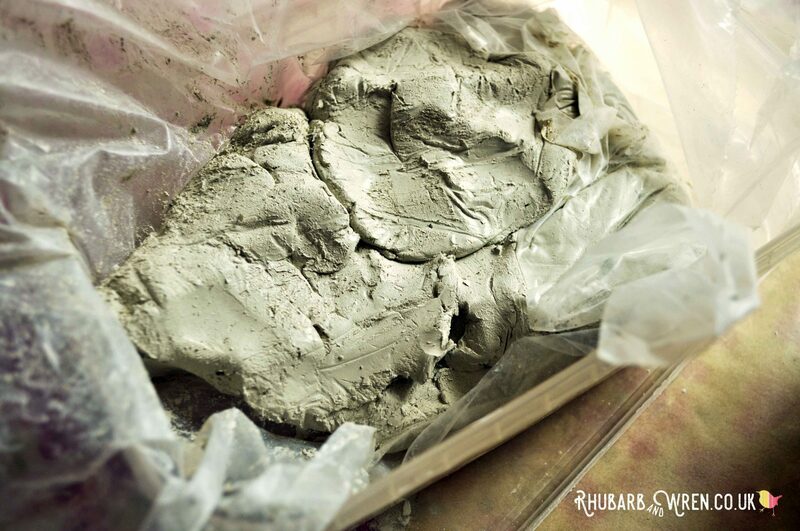 Once you open the packet, make sure you keep your unused clay in an airtight container to keep it from drying out. You can get this clay in different colours, but I tend to stick to white or grey as they make a great base for painting. Keep your unused clay sealed up tight, and it will last for ages. Air dry clay is very sticky (much like normal clay!) so lay down some greaseproof/baking paper or a bit of plastic to protect your surfaces. If your clay is really sticky, try leaving it out in the air for a bit – or put it in the fridge for ten minutes if you can’t wait! Because it’s so sticky, it can be tricky to stamp into air dry clay. Making our pendants, I found it helped to have a small bowl of cornflour (cornstarch) on hand. Dust your stamp with a little of this before using and it’ll stop the clay sticking to it. I’m guessing talcum powder would probably work too. 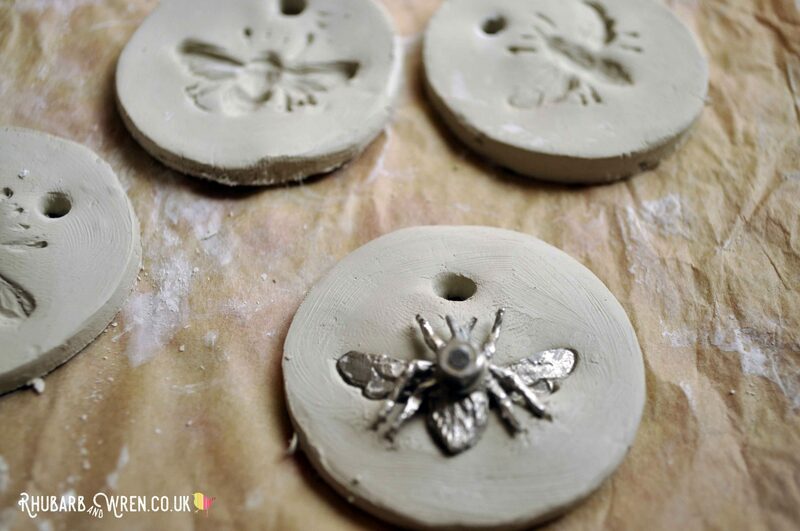 A quick dip in some cornflour is all this bee needs to stop the clay sticking. 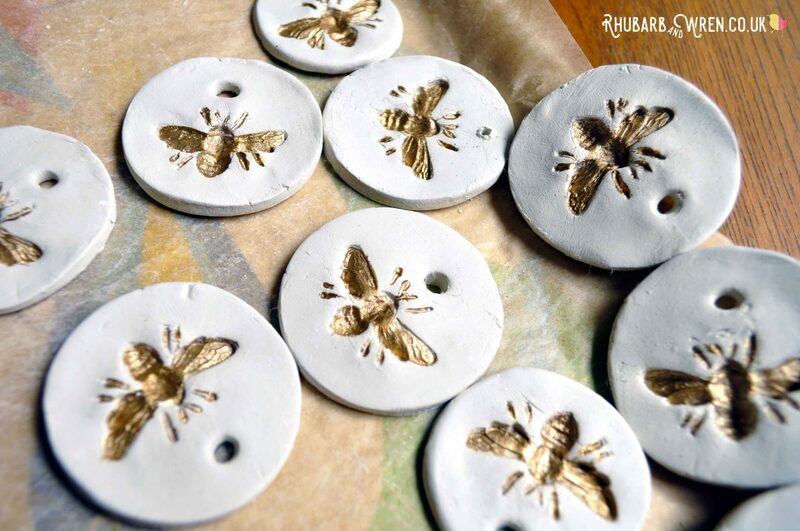 Bear in mind that the finished bee necklaces won’t be as durable (or waterproof) as kiln-fired clay, and so I varnished my air dry clay pendants to make them a little more water resistant. I anticipated that there may be the odd breakage (we had only one in the end), so I also made some extras as backup. Product links in this article are all Amazon links to materials I used for this air dry clay pendants project. These are all affiliate links and you can find out more about what that means on my ‘about affiliate links’ page. a bee stamp or improvise with something bee-ish, like this bee hair-clip! First of all, start by rolling out your clay to between half / a centimetre thickness. If your air dry clay is rolled too thin, you may find that you don’t have enough depth to get a full impression if you have a 3D stamp like my bee. The clay is also more likely to crack as it dries if it’s too thin. My bee, incidentally, came from the lid of an empty candle jar that I found in a charity shop and bought for 20p. Happy days! 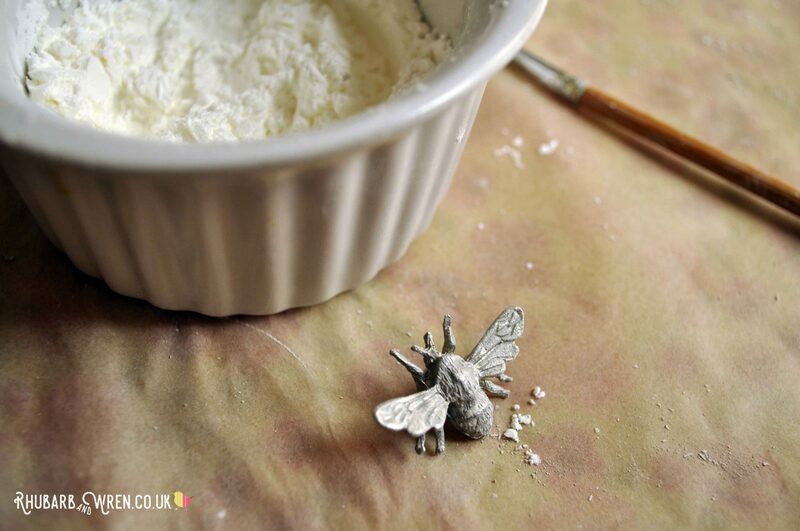 This little bee has lots of textural detail, making it great for stamping into clay. Next, use a biscuit cutter to cut out your pendant shapes from the clay. As the hexagon cutter I intended to use had disappeared into the mud kitchen or play dough box, never to be seen again, I used a circle for mine. 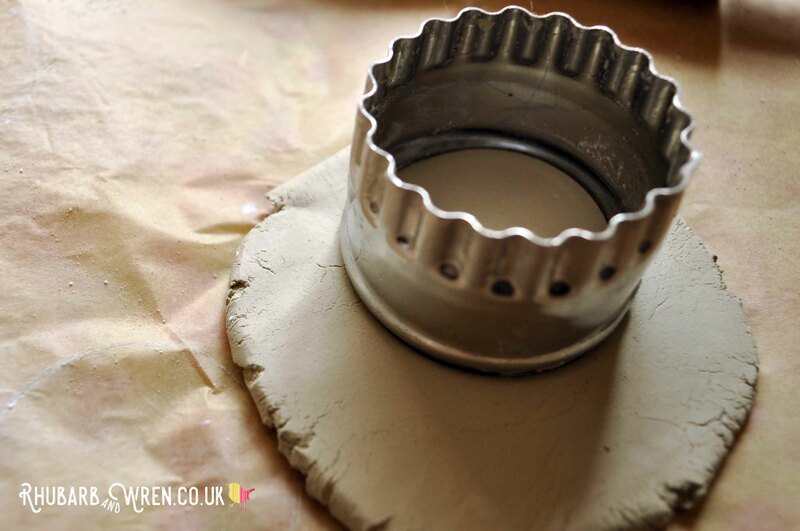 Biscuit cutters work just as well on clay as on dough! 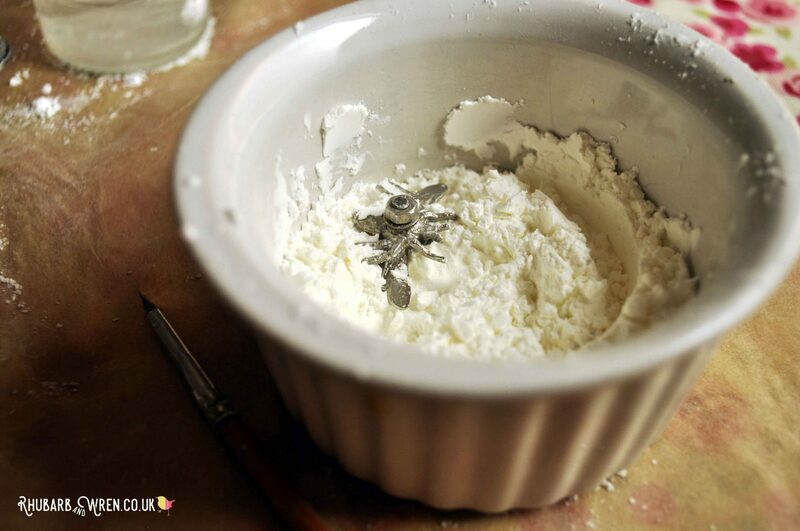 Once your pendants are ready, dip your stamp into your bowl of cornflour, to give it a slight coating. This will help stop the clay sticking to it and will give you a cleaner impression. Using a fine powder like cornflour is important, as you don’t want it clogging up fine lines in the detail. 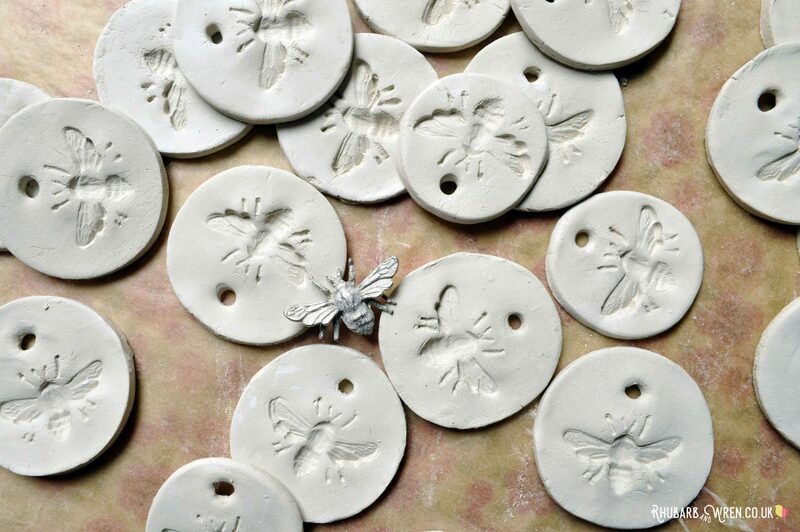 Stamp a bee into each of your air dry clay pendants but be sure to reapply the flour regularly. Use a little water to wipe away fingerprints once you’ve stamped your image. As you stamp your bees, use a pencil, chopstick, skewer or other pointy thing to make a hole in the top of the bee pendant. This is for threading it onto string. Do this before the clay starts to harden! Yes, I am speaking from experience. A paintbrush, pencil or skewer will make a neat hole for your pendant. Finally, leave your air dry clay pendants to harden in a warm, dry, place. Allow at least twenty-four hours for this – I left my bee pendants for a couple of days. Your air dry clay should come with guidance on the right amount of time as it can differ a little bit depending on the brand. Roll, cut, stamp, and then leave to dry. 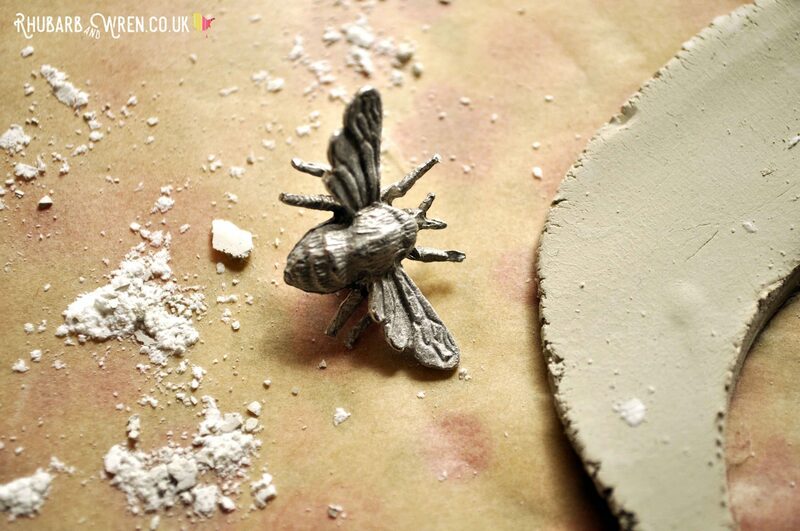 That’s all it takes to make these adorable bee pendants. As moisture can get trapped underneath your clay when it is drying, turn the pendants over carefully every now and then (even if drying them in the oven). This will also help stop them cracking because the pendants will dry out more evenly. 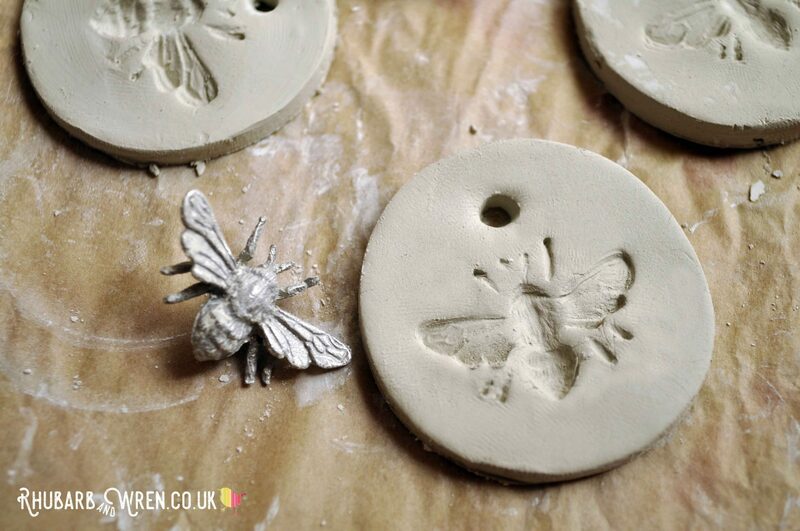 These little bee pendants are so quick to make, you can make a load in one go! Once the air dry clay has hardened fully, you can paint and varnish it. I used some gold metallic paint I had left over from another project (no, not my bedroom!) to make gorgeous gold bees. I used a metallic gold paint to add a bit of bling to my bees! One thing to note about metallic paint is that a topcoat of varnish may dull down the metallic effect, especially if the varnish is a matt finish. The only way around this is to put the paint on top of the varnish, and therefore use a paint that’ll be durable without the extra protection from varnish. I used a toothpick to colour the legs of my bee, as I could be more precise than with my paintbrush. Lastly, thread your air dry clay pendants on some string, and you’re done! 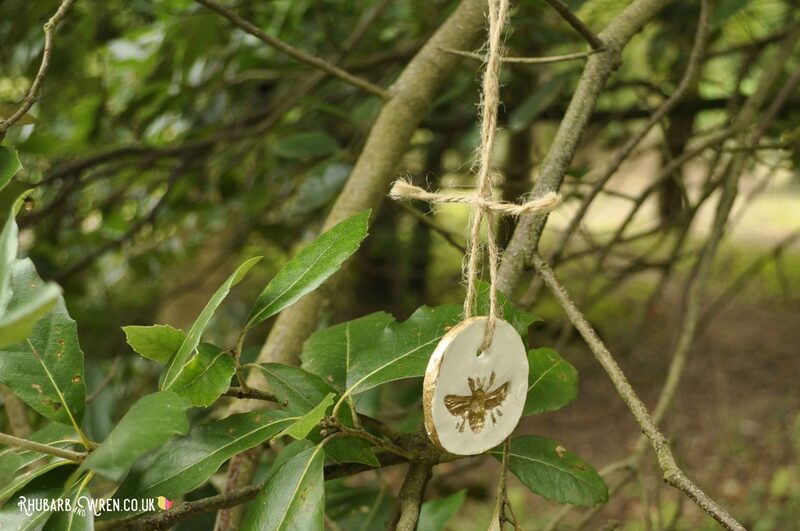 Want to see how we used these bee pendants for an amazing, collaborative kids’ treasure hunt? Then check out the Bee Hunt post for all the details. The perfect treasure for a woodland treasure hunt! 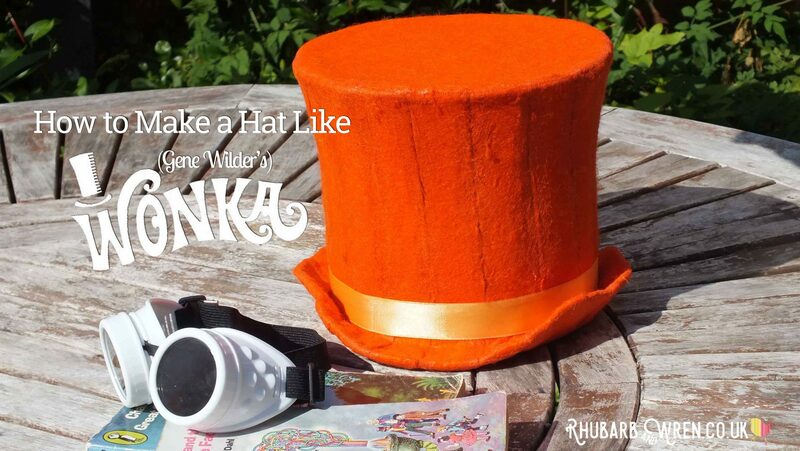 Looking for more fun things to make and do with the kids? Take a look at these great activities. ● a circle cutter or other shape. Hexagon, anyone? ● a bee stamp or improvise with something bee-ish, like this bee hair-clip! 2. Use a biscuit cutter, lid or glass to cut out your pendant shape. 3. 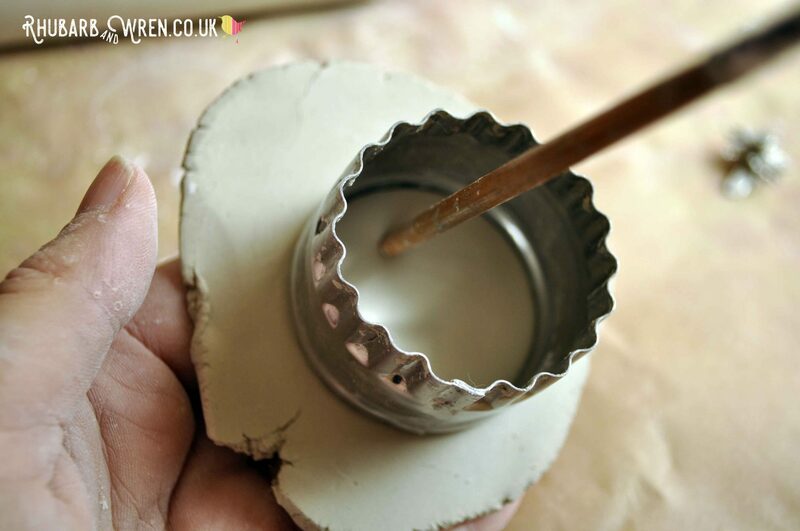 Dip your stamp in cornflour before using, to stop the clay sticking. 4. 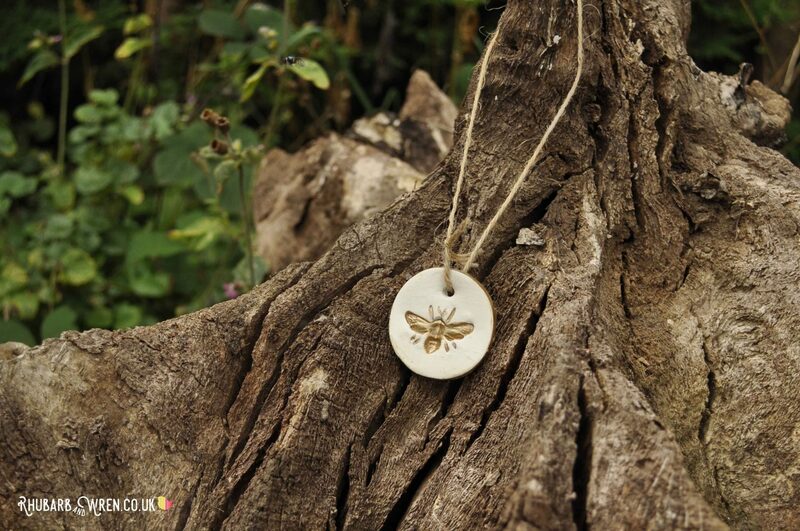 Ue your stamp to imprint your bee design onto the pendant. 5. Use a pencil, straw or similar to make a hole at the top of your pendant. This is for threading your string, so make sure it’s big enough. 6. Leave your pendant to harden for at least 24 hours in a warm, dry place, or alternatively put in the oven on the lowest possible setting to speed up drying time. 7. Once dry, paint and/or varnish. 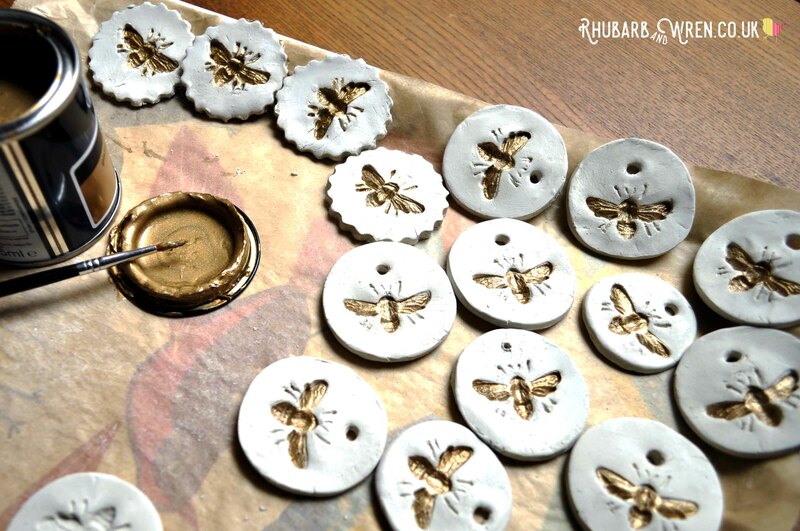 Varnish will seal the clay and therefore protect it from moisture so don’t skip this stage if you want your bee necklace to last. 8. Finally, thread some string through the hole to finish. Your bee pendant is done! ● Put the clay in the fridge for a short while if it is really too sticky to work with, as this will help reduce the tackiness. ● Dip your fingertip in a little water to smooth away imperfections and fingerprints as you work. ● Turn over your pendants as they dry so as to avoid the clay cracking or not drying out fully. ● Put unused clay in an airtight box and it will keep for ages. I love using clay with the kids – it feels really different to play dough or plasticine, plus they get to keep their creations once they harden! Oh how pretty! I love the bee design. This would be a great activity with my daughter. Never tried using air dry clay. That’s such a great idea as the kids would get to keep their creation. The pendants look lovely, well done! Thank you! And it’s ridiculously easy to use – just leave for a few days to harden once you’re done. Thanks Alex – though I have to say it was pure luck! These are so cute! I can’t believe how simply they are to make, they look really impressive. Love the bargain bee stamp! These are so cute – what a great idea! I love these! My mum made something similar with my son a while ago – placing replica fossil and toy dinosaur models into clay. That sounds like loads of fun – I bet your son loved making his own fossils! They look beautiful! We’ve done something similar before with bugs to make ‘fossils’. Oh I love this idea and those bees are so cute! !